An exquisite Art Deco custom made platinum necklace and fine link chain, featuring 30 channel-set caliber cut emeralds, est. 2.58ct. 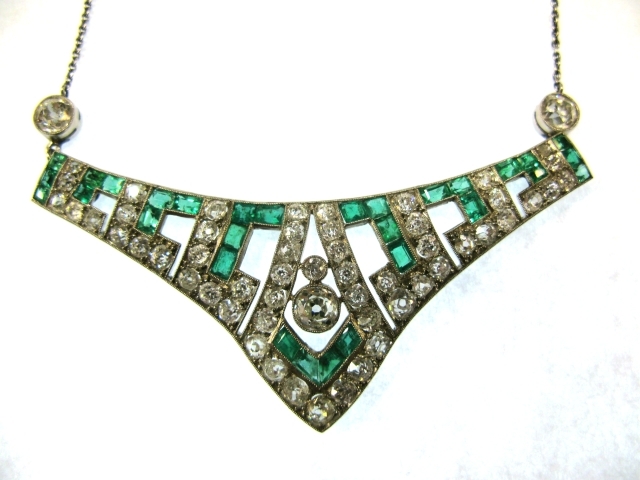 (clarity: MI & colour: medium intense green with slight yellow hue); 3 bezel-set old european cut diamonds, est. 1.47ct (clarity: VS-SI2 & colour: H-I-J) and 54 old european cut diamonds, est. 3.28ct. (clarity: SI-I1 & colour: H-I). It is approx. 16.5 inches (41.91cm) long.